A handsome express cruiser with standard amenities galore, the V458 is a well laid out boat with room for two staterooms and 2 heads. Fast and efficient, her IPS600's push her to nearly 35 knots WOT, yet will happily cruise at 27 knots. 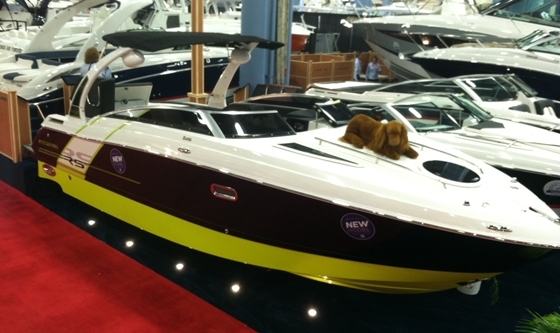 Her fully enclosed helm is air-conditioned and heated, with great visibility, optimal controls with a bow thruster and IPS joystick, and a full array of electronics, including autopilot. This V458 (later called the V475 -which isn't surprising based on her size), called "Jersey Girl", has gorgeous black hull sides, a huge swim platform with dinghy, has been well maintained while stored under cover, in brackish water for a good portion of her life. The V458 features a hard top with skylights, along with a vented center windshield. Custom-matched pillows are available, creating a warm, welcoming atmosphere from the first steps aboard. Built for entertaining, the V458?s on-deck refreshment center is the fast track for icy beverages and delectable snacks with its built-in blender, large solid-surface countertop, sink, refrigerator and icemaker. Of course, beverage holders are plentiful and made from stainless steel. The standard removable cockpit table is convenient for snacks and socializing. A flat screen cockpit television is another option for keeping abreast of the latest news and best in entertainment via the standard cable TV outlet. 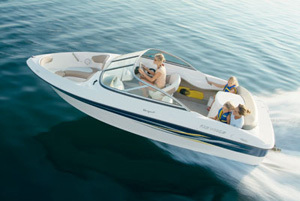 Beyond the natural music of the water, the V458 is equipped with a Sony AM/FM/CD stereo system. Sirius Satellite entertainment is also included with a complimentary six-month subscription. Enclosed cockpit with double helm seats and flip up bolsters, raised dinette with electric teak table, aft seating with teak table, wet bar with sink, fridge and ice maker. Overhead lighting, unique (2) volt lamps and overhead hatches and aft enclosure. Large salon with electric dinette table, entertainment with 2 salon TV's and Bose Surround sound, 2 staterooms (master forward with island queen, guest is aft with side by side berths), 2 heads, a complete galley and unlike the majority of her express cruiser peers, great natural lighting below. At the double width helm seat with driver-side power adjustment and flip-up bolsters, the sophisticated dash showcases a charcoal finish as the backdrop for controls and tilt steering wheel. A compass is standard to help guide the way, in addition to the Volvo Electronic Vessel Control instrumentation with a fuel gauge, oil pressure, tachometer, temperature, and volt meter. Dual engine binnacle controls are also included. Trim tabs are standard and fingertip rocker switches feature LED lighting for optimum visibility. And when the weather doesnt cooperate, port and starboard windshield wipers improve visibility for captain and crew. For utmost safety precautions, a gas vapor gauge is standard. Plus, to protect the dash when not in use, Four Winns includes a canvas helm cover. There is plenty of space for additional navigational equipment. Large enough for the entire swim team, the V458's extended swim platform is the destination for water-lovers. With plenty of room for lounge chairs, the platform is outfitted with two angled, deep-reach ladders with wide-step pads for the swimmer's comfort, and blue courtesy lighting. Another popular attraction is an electric grill at the transom for good eats and fun in the sun all in one location. An aft shower with hot and cold water is convenient for rinsing away sand and debris. Optional underwater lighting consists of large light fixtures mounted below the swim platform, filling the surrounding water with a luminous glow. 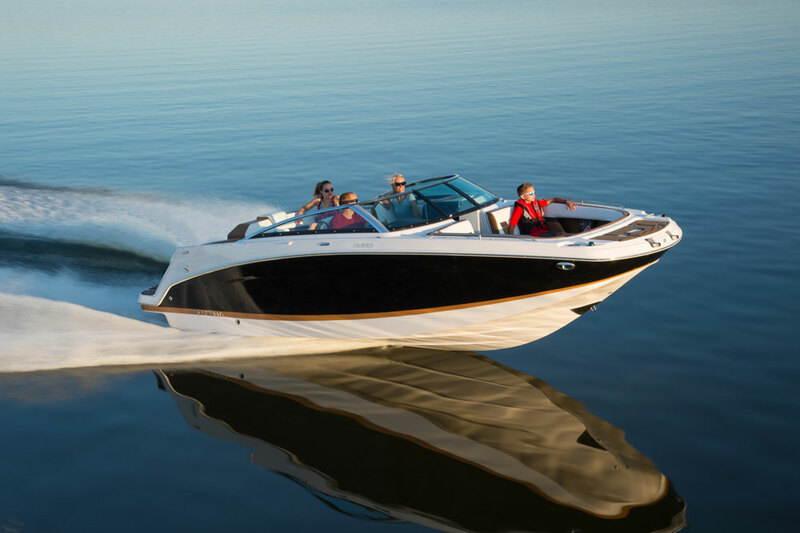 Volvo's revolutionary Inboard Performance System (IPS) and joystick control add to the vessel's appeal by allowing the ultimate in ease and precision. 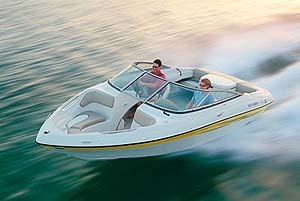 By swiveling the top of the joystick, the boat turns on its axis; or the joystick can simply direct the boat to move in the desired direction. Access for servicing the motors in the engine room is excellent. A few steps beyond the screen cabin door, the salon opens up to a spacious, well-appointed oasis. The dinette provides ample space for a comfortable family dinner, and with the adjustable-height table, the area can quickly be converted to a cocktail lounge. When there are extra guests, the dinette converts easily to a berth. The L-shaped galley is graced with generous solid-surface counter space and beautiful woodgrain cabinetry. Under-cabinet lighting makes coffee-making and meal prep a snap. The V458?s two-burner flush-mount stove, refrigerator/freezer, microwave, and trash receptacle are all discreetly mounted within the woodgrain encasements. Flooring in the galley area is beautiful teak and holly for easy clean-up. Two 16,000 BTU air conditioners keep the cabin cool and comfortable and safety is a given with the standard CO monitor. And when entertainment is in order, the salon boasts a wide screen TV and Bose® surround sound. Private spaces add to the homelike feel of the V458. Four Winns designed a forward stateroom with widescreen TV as a standard master suite. It is complete with a raised berth with innerspring mattress, overhead lighting, and under-berth storage. Mid cabin is also a private stateroom that comfortably sleeps two guests in oversized twin berths that can be joined with fill-in cushions. There is a TV with DVD player, and a workstation desk that does double duty with generous storage in its dresser drawers. Storage is also plentiful in the cedar-lined hanging locker and beneath cushions. Particularly useful during a long voyage is the optional washer and dryer combination located mid cabin. The cabin?s multi-zone lighting and window system sets the mood for entertaining and allows for isolated lighting. Window blinds are included in the salon. Plus, iPod/MP3 ports at the cockpit and cabin add to the V458?s easy entertaining capacity - to listen to a favorite music collection, or charge a cell phone with the 12-volt chargers. The V458 boasts a master head with separate shower area, along with a mid-cabin head and shower. The master head and shower?s spacious design and function are added luxuries, equipped with a sanitation system, and separated hot water shower. The solid-surface vanity and sink are surrounded by plenty of storage, power receptacle, and a towel rack; all illuminated with overhead lighting. Ventilation is no problem with the screened port light and power ventilation fan. Tank level indicators in the cabin help to ensure fresh water and waste are attended to as needed. At mid cabin, an additional head is similarly-equipped for guests with a sanitation system, shower, solid surface vanity with sink, storage, mirror and towel rack.